Most of us have old hardware lying around doing nothing. Trying to run a recent version of Windows on such hardware will have you wanting to harm yourself. A good distribution of Linux can improve the usefulness of your old hardware vastly. On particularly old hardware, however, large speed improvements can still be produced by throwing out the heavy Gnome and KDE desktop environments and switching to something a little more lightweight -- such as OpenBox. K. Mandla's blog is a wonderful resource when it comes to setting up and using such an environment. Being a fan of minimalism, I only use docker (a system tray -- nothing more) in my set-up. Right-click menu on the desktop, alt-tab, system-tray; what more does a man need? Of course, minimalism is only so useful on its own. Bloated desktop environments have features for a reason -- some of them are useful! In particular, I miss Gnome's panel clock. Click on it and it spits out a calendar. Very useful when you're like me and don't remember what month comes after July. Enter lal. I discovered it here. The largely anonymous Mikachu, with the help of Dave Foster, have produced a wonderfully miniature clock for your system tray. Next to no dependencies when installing, either. Either enter your options on the command-line or put them in ~/.Xdefaults. I use "%a %e %b, %l.%M%P" as the format string to get a similar look to Gnome's clock. I still needed one more feature; a calendar. So I hacked lal to become lalcal. 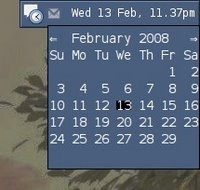 It has similar functionality to Gnome's clock -- click on it, out comes a menu, change the month by clicking on the arrows. Doesn't take up much more resources than pure lal. The code is not beautiful; I'm a beginner with Xlib, and as soon as it started working I stopped writing. Interestingly it uses cal to render the output. Most Unixy systems have this installed -- I believe it first appeared in version 6 of AT&T UNIX.